Lucky Peterson is one of the most versatile blues musicians in the international scene: blazing lead guitarist, fantastic organist and a first-class singer. Born Judge Kenneth Peterson in 1964, he was taken under the wing of the legendary Willie Dixon at the young age of three. Just five years old he released his first record, one year later he appeared on television shows such as The Ed Sullivan Show, The Tonight Show with Johnny Carson and What’s My Line with a remarkable stage presence – showing his potential as a performer. Trained by keyboardists Bill Doggett and Jimmy Smith, Peterson went on to play behind Little Milton, Bobby “Blue” Bland and Kenny Neal. On return from the “Young Blues Giants” tour of Europe, he signed first with Alligator, then Verve, Blue Thumb and Birdology/Dreyfus, where he recorded what Amazon.com called “his finest album”, Black Midnight Sun, in 2003. The New Yorker called him “a master of the guitar, organ and microphone”. 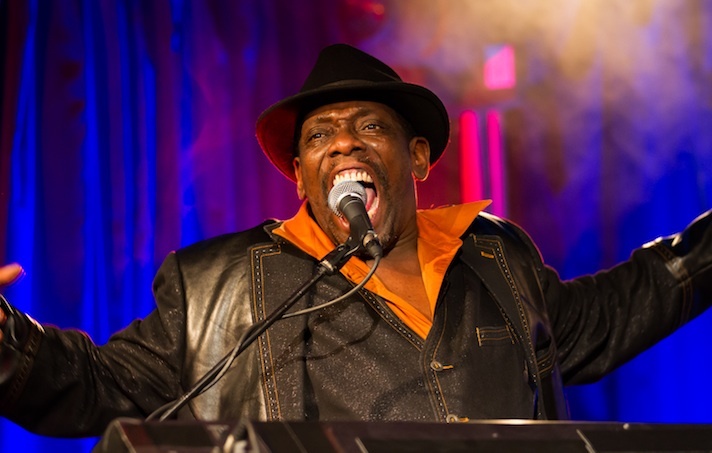 Next to a row of studio productions – he took part in over 300 albums – Peterson has made his name with a string of electrifying live performances: his gospel, funk and soul enriched blues as well as his virtuosity and intensity excites the audiences he plays for at every club and festival. Peterson’s CD You Can Always Turn Around won the Grand Prix du Disque (the French Grammy) as Blues Album of the year 2010 and was nominated by the Blues Foundation for the Blues Music Awards in the category of Best Acoustic Blues Album 2011. Chicago’s Illinois Entertainer announced it as: “Perhaps the most moving and innovative blues CD of the year. In 2012 Lucky Peterson released his very first live CD/DVD, The Lucky Peterson Band feat. Tamara Peterson live at the 55 Arts Club Berlin, with Blackbird Music. It was nominated for the 34th Blues Music Awards in the category “Best DVD” and made it into the Bestenliste 1/2013 of the German Record Critics’ Award.